Fabulous photos of 3 week old twin polar bear cubs (born December 9, 2013), have been released by the Hellabrunn Zoo in Munich, Germany. There’s video of the births as well. 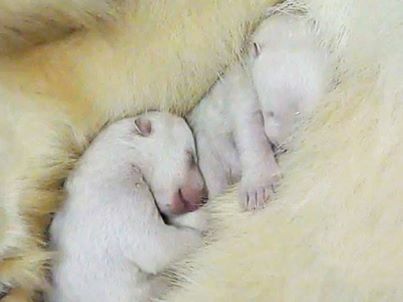 The newborn cubs are so tiny — it’s hard to imagine them being born in the dead of winter in a snow den! All but one of the photos shown here, including the one above, are of the newborns at 3 weeks of age. 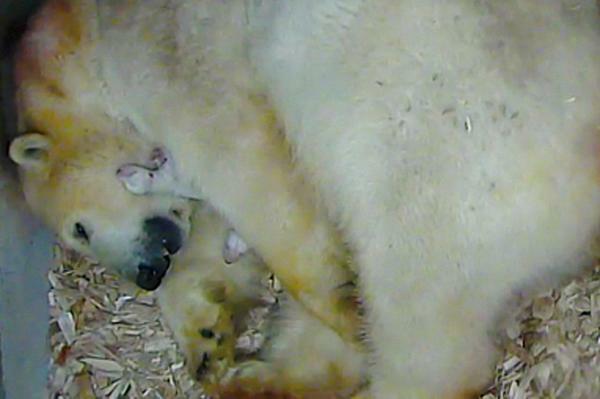 The one below is a screen cap taken from the video of the birth, and is the only one that shows the cubs just hours old. They seem to have grown a bit in 3 weeks. 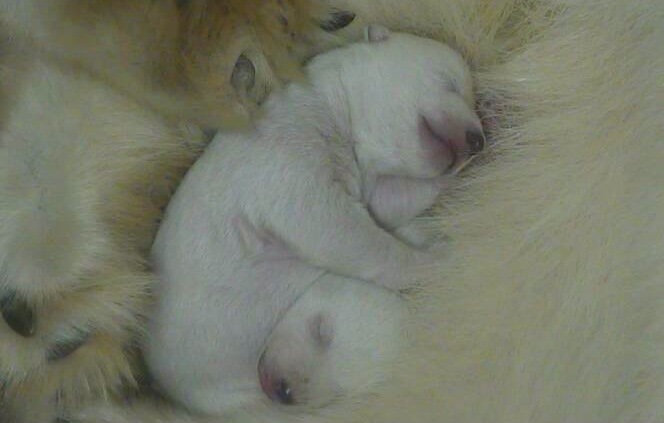 “On December 9, a Polar Bear named Giovanna gave birth to two cubs at Munich’s Hellabrunn Zoo. Both births were seen on cameras installed in the birthing den and the connecting corridor to the main den. This is remarkable on two counts: for both births, Giovanna positioned herself so that she was directly in the cameras’ field of view. 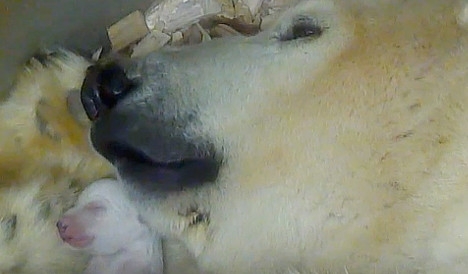 Secondly, this is the first time that a Polar Bear birth has been filmed in color worldwide! “08:37: Giovanna walks down the corridor between the two dens. She bites one of her front paws to counteract the pain of a contraction. Then she moves out of camera view but then takes several steps back into frame. 08:39: View of Giovanna’s back. A polar bear cub slides onto the floor in a very speedy birth. It is about 8 inches (20 cm) long, hairless, smeared in blood, blind and deaf. 09:40: Giovanna pushes her back legs forcefully against the wall and her body shakes as she has a contraction. 09:43: A thin arm, a small head and then another arm come into view. Giovanna gives birth to a second baby. At this point she is so busy with her first born that she doesn’t attend to the second baby immediately. The little one is left to fend for itself for the next few minutes. It wriggles and turns round and is very active. 10:05: Giovanna notices something going on behind her. She turns her head and notices the second baby. She turns round and picks it up carefully in her mouth. Then she leans against the wall and lays it on her leg next to its older sibling. “The seven-year-old gave birth to both cubs within an hour at Munich’s Hellabrunn Zoo. The first of the mousey grey twins weighed barely 400g, according to the Münchner Merkur newspaper. Giovanna carefully picked up the blind cub and carried it in her mouth to the neighbouring enclosure. Less than an hour later she gave birth for the second time. Both births were quick and free of complications. The footage of Giovanna was taken by a surveillance camera in the “Mother and Child House” at Hellabrunn Zoo. Since 2011 Giovanna has been taken to the birthing house on three other occasions but these turned out to be false alarms. There’s no doubt that these are spectacular photos, showcasing a phenomenon you would never see in the wild, and I’m glad to have seen them. But there is also no doubt that the release of the photos and video will increase the public’s interest in paying money to see the bears in person — and as a consequence, increase revenues for the zoo. As I’ve noted before, polar bears are now a huge draw for zoos, who are now spared the protests from environmentalists and animal rights organizations [and who have the support of Polar Bears International] – in contrast to just a few decades ago, when zoos were pressured to get rid of polar bear exhibits. I’m of two minds: I think zoos serve an important educational role (at a price that unfortunately not all can afford), but at the same time, I’m disturbed by the way some of these organizations are using the premature “threatened” status of polar bears to justify keeping animals they wouldn’t have dreamed of keeping 20 years ago because it would have raised the ire of animal rights proponents and environmentalists. This entry was posted in Advocacy, Life History and tagged Hellabrunn Zoo, newborn cubs, photos, polar bear, polar bears in winter, video of birth. Bookmark the permalink.